Welcome to Kyra's Legend of the Five Rings Vacation Campaign. (ie. this game only runs during breaks from classes.) The world of L5R is similar to ancient Japan, but very different as well. Rokugan is populated by noble samurai, evil monsters, Kami, ghosts, ancestor spirits, not-so-noble samurai and many more! This fall, either November 20 or 21 (Saturday or Sunday), Yume no Sakura will be presented as a Live Action at Master's Gaming Konnection's Fall 1999 MagiKon! We shall be enjoying the opening day of Winter Court. There is plenty of room for other players and lots of npc's to go around. If you are intrested in playing and are not a regular player in Yume, please e-mail me! I would like the important npc's to only be played by people who know the characters and are good/experienced role players. Thanks! Characters in Yume no Sakura. Character Descriptions with pictures -- work in progress! 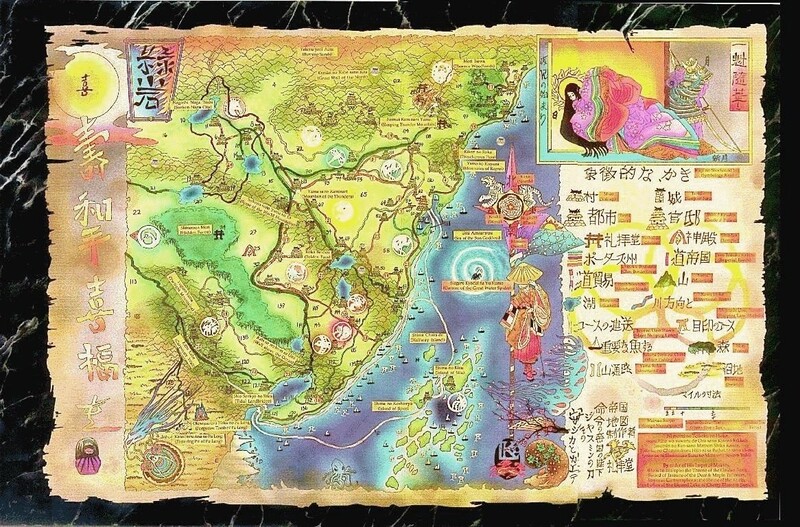 The Rokugan map of Yume no Sakura.